New emojis depicting differently abled people and lifestyles were accepted and approved by the Unicode Consortium, to be released to smartphones in 2019. The vast world of emojis is one step closer to expanding once again. Thirteen variants of emoji to represent people with disabilities that were proposed last March by Apple to the the Unicode Consortium, the global organization that adopts standards for emoji, have been approved and added to the list of forthcoming emoji. 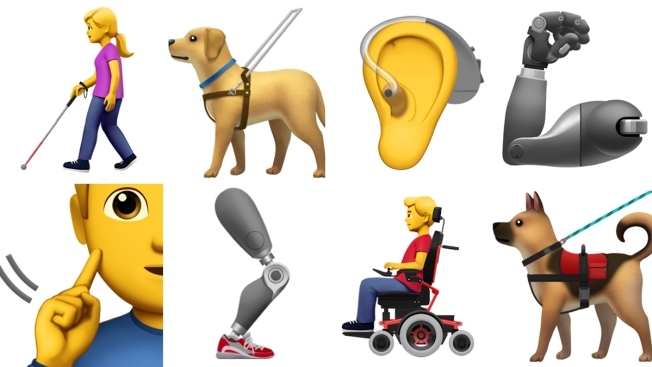 Among the emoji that will soon be available are a person with a white cane, an individual sitting in a motorized wheelchair, a prosthetic arm, and someone signing the word "deaf." One other noteworthy addition to the emoji library is a single drop of blood, intended to offer women a way to discuss menstruation. "There’s a lot of silence, stigma and shame around periods and this can and does have a negative impact on girls and women," the Apple proposal stated. "We believe that having a well-designed period emoji can help break these negative stereotypes. And that by creating more conversation around periods we can send a message that periods are something we should be comfortable talking about, that they are normal, natural and not shameful." To come up with the proposed emoji, Apple reportedly collaborated with a number of organizations including the American Council of the Blind, the Cerebral Palsy Foundation and the National Association of the Deaf. "For this proposal, we have selected a set of proposals that are most inclusive to a large number of people in four main categories: Blind and Low Vision, Deaf and Hard of Hearing, Physical Motor, and Hidden Disabilities," according to the Apple proposal. To see the entire list of of newly approved emojis, click here.